Unlike Abrahamic faiths, Hindus are not strictly a ‘book-religion’. Although sacred texts exist in hundreds (‘Mahabharata’ in 100,000 verses is the longest poem in the world), they are merely considered as a guide to experience and realize the Supreme Reality. In this part we discuss the relative importance of scriptures vis-à-vis Dharma and Moksha. With all the benefits of studying scriptures, it must be clarified that even the study and recitation of scriptures is no substitute for good conduct and pious living. One cannot wash his hands off goodness and perform evil actions thinking that his scriptural learning will save him. The Vedas cannot help a man who does not have a virtuous conduct, even though he may have studied them together with the six Vedāngas. At the time of his death, the Vedas abandon such a man, just as birdlings fly out of their nest when they become adults. Study of scriptures is only one of the virtues of acts of Dharma. Dharma is much more than studying scriptures. They who are masters of scriptural learning but are evil in their conduct have merely wasted their time in studying the holy books. Therefore, scriptures are a means to knowing the difference between Dharma and Adharma, and not a substitute for practicing Dharma. Hinduism also does not consider study of scriptures as the final goal. Unlike Abrahamic faiths, Hindus are not strictly a ‘book-religion’. Although long revelatory and other sacred texts exist in hundreds (‘Mahabharata’ in 100,000 verses is the longest poem in the world), they are merely considered as a guide to experience and realize the Supreme Reality, which is beyond all books and intellectual enterprise. What good can the Vedas do unto him who does not know that Great Being, who is All-pervading and Eternal, Holiest of all, Who sustains the Sun and the Earth, and is the support of the learned, the method of Whose realization is the chief aim of Vedic teaching? But they alone enjoy eternal bliss who study the Vedas, live a righteous life, become perfect Yogis and realize God. Rigveda 1.164.39. The mere study of the letter of the scriptures does not have much benefit. One should first study the scriptures, try to understand their essence and finally practice the same to achieve the final goal of their teaching – spiritual realization. Moksha is the final goal of our life, and therefore also the final goal of scriptural study. If scriptural learning does not advance one’s understanding of God and lead us closer to Moksha, then it is of no use. And when the goal is achieved, the scriptures have no value left because the means of reaching the goal are of no further use once the goal itself is reached. As state above, a study of scriptures and following their teachings is a pre-requisite to advancing in Dharma and Moksha. However, many people study the scriptures with the wrong intentions, or they believe that they are very Dharmic and are entitled to Moksha just because they have mastered the scriptures. The following parables from the Hindu tradition teach the correct and the wrong ways of studying the holy books. The story of Vāmana Pandit below shows how mere learning of Gita and other scriptures does not benefit us spiritually. We become ‘alive’ only when we give up our ego and pride, when our heart is filled with devotion, and when we are able to teach the scriptures to the common man in a simple language out of love and compassion. “Vāmana pandit was born in a Brahmin family of Bijapur, which was under Muslim rule. Even as a young boy he could compose Sanskrit verses. 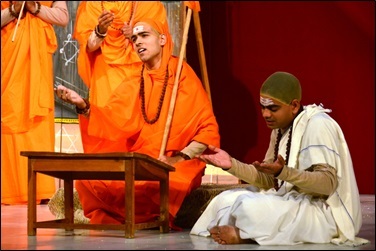 When the ruler Adil Shah heard of this child prodigy, he offered to support the boy, if he embraced Islam, so the family sent him secretly to Varanasi to study under some scholars. 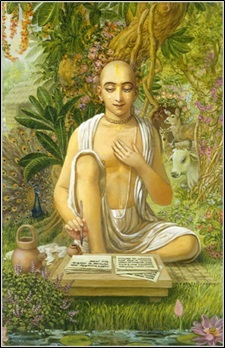 After studying there for about twenty years, Vāmana became quite famous for his knowledge and skill at debating. He used to go on tours and challenge other pandits to a debate. 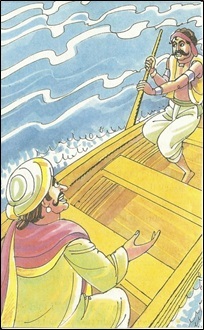 Hearing of Ramadasa, he decided to visit him and challenge him also to a debate. When he arrived near the place where Rāmadāsa was staying, Vāmana pandit sent a messenger to get Rāmadāsa. Vāmana waited and waited under a tree, but by midnight Rāmadāsa had still not come. At that time, he happened to see two ghosts, and overheard them talking about him. The ghosts were saying that Vāmana would soon be joining them. Vāmana pandit became very afraid. He thought about what the ghosts had said and gradually understood that his egotism and pride of scholarship was leading him to hell. In fact, he became so repentant that he decided he would approach Rāmadāsa for spiritual instructions. Sage Bharadvāja and his son Yavakrīta were neighbors of Sage Raibhya and his sons. The latter were all great scholars. Many people travelled long distances to study under Raibhya and his children. This made Yavakrīta jealous. But he did not like to study. So, he started praying to Lord Indra. 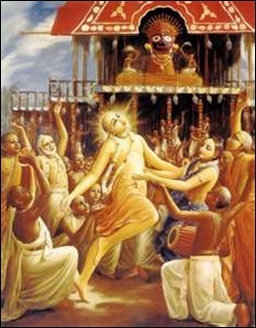 Pleased with Yavakrīta’s penance, Lord Indra appeared in front of him and offered him a boon. Yavakrīta asked that he become a great scholar, so that people should come to study under him, just as they went to study under Raibhya and his scholarly sons. Yavakrīta realized that it was Lord Indra who came disguised as the old man to teach him that worship alone cannot result in scholarship. He therefore apologized to Lord Indra and started studying diligently. 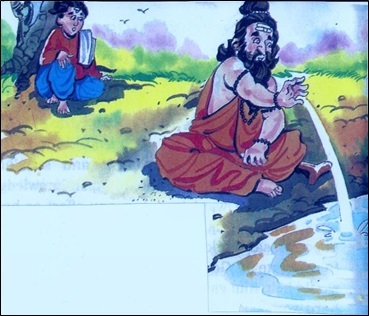 A Sanskrit proverb reads – “Just as a blind man has no use for a mirror, what will he do with scriptural knowledge if he lacks common-sense?” The following story from the Panchatantra illustrates the truth that in addition to mastering the Holy Scriptures, one must also have commonsense. But the third of them was a kind hearted person. He said, “We have been friends since our childhood. Therefore, it is not fair to leave him behind.” So all the four got together and started walking towards the palace. On the way, there was a jungle. There, they saw a pile of bones lying on the ground. They immediately recognized that these bones belonged to a dead lion. 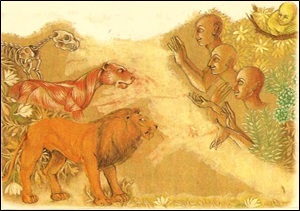 The first scholar said, “I know how to put these bones together and complete the skeleton of the lion.” He used his knowledge, and within a few minutes, the skeleton was ready. The second scholar said, “I know how to put blood, skin and muscles into the skeleton.” He too worked for some time, and soon, the skeleton had muscles, eyes, blood and skin on it. The third scholar said, “I can give life to this animal and make it alive!” Everyone seemed impressed. But, the fourth friend, who was not very scholarly, immediately stopped them and said, “Do not be foolish. A lion eats human beings. If you make it alive, it will pounce on us and eat us.” But the three did not listen to him. 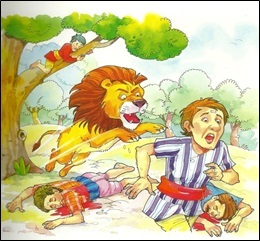 However, he begged them to allow him to climb a tree before they make him alive. They agreed. Rishi Durvasa realized that Rishi Narada was saying the truth. He realized that his behavior had been foolish. In repentance, he discarded his books in the ocean, and left the assembly to do meditation to atone for his inappropriate behavior. Once, Shri Shankaracharya was walking along the banks of the Ganga River in Varanasi with his disciples. He saw a very old Pandit, almost on his death bed, trying to master and teach the rules of Sanskrit grammar. Out of compassion, the Acharya composed a stotra of 13 verses, in which he asks humans to seek refuge in Krishna because only He can save us at the time of death. Learning rules of grammar for mere intellectual satisfaction will not save us from death. The 14 disciples of Shankaracharya added a verse each, and collectively, it became a Stotra of 27 verses. This beautiful stotra is called Bhaja Govindam, or Moha Mudgara (a Hammer to shatter delusion). The stotra teaches the worthlessness of worldly desires and ego and asks us to seek refuge in Bhagavān by chanting His names, reading the Gita, and becoming dispassionate towards worldly pleasures.